Support for Unity’s new UI continues to improve in the latest LeanTween (more features, and more testing for stability). 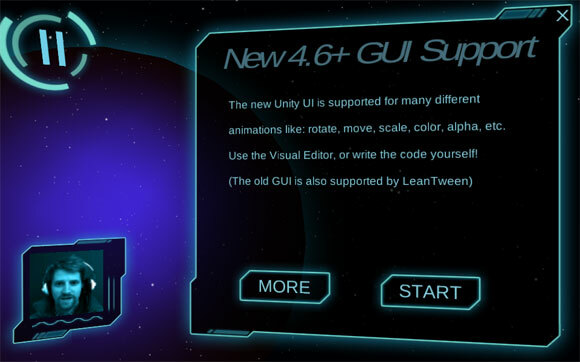 The latest LeanTween Editor features a new space themed ui skin that demos a lot of the LeanTween UI animation features. Animate the image ui item (UnityEngine.UI.Image) directly with LeanTween. The other ones that have been around for awhile: move, scale, rotateAround, alpha, color (all specifically targeting the new RectTransform object). Please remove default parameters from LeanTween. They don’t work with MonoDevelop set to Target framework .NET 3.5, it always causes compile errors. They work in NET 4.0 but there is a known issue in Unity that if you set Monodevelop’s target framework to 4.0, it switches back to 3.5 everytime you reload the project and all the default parameter errors come back. I don’t know how you didn’t see this and released it like this, it’s amazing to me, it seems such a basic thing. Has been like this for months and it’s really annoying, it’s such a useless indulgence to use default parameters and you can easily fix it. That break in MonoDevelop? Is there specific versions of Unity that this is a bug with? The issue has been there at least for a few good months (now I am using Unity 4.6.3). It’s there if you use LeanTween with Unity out of the box. This is a shame because it might turn people off it. I work around it by manually editing LeanTween.cs to remove all default parameters with each update, however this might break things. I’m sorry if I was a bit harsh in my first comment. The plugin is fantastic and I was getting a bit fustrated because i love it so much 🙂 Thank you for the work and for making it available! Can LeanTween tween between colors on a SpriteRenderer? If so, can you please show me to code it? Hi Rabbit, Yes it can. There is an example scene that highlights this: “GeneralBasics2dCS” . The code can be found on lines 53-59 on “GeneralBasicsCS.cs”. Hello, I’m new to Unity and new to LeanTween — I really enjoy the similarities of LeanTween and other tween engines I’ve used with other technologies in the past. The online documentation (on http://dentedpixel.com/LeanTweenDocumentation/classes/LeanTween.html) seems to describe version 2.31, but the version on the Asset Store is 2.30. A bit misleading. I need to use alphaCanvas, which does not exist in 2.30. For now I hacked around using a value tween, manually getting the CanvasGroup components and setting their alpha in the onUpdate() delegate. Good enough, but not really clean. Any release date for the 2.31?